Can Homeland Security Be Convinced to Suspend the Airport Body Scanner Program? The Bill of Rights Defense Committee has a new report on the broad yet ideologically diverse coalition of over thirty organizations that has come together to put a stop to this blatant example of “security theatre”. They have already filed a formal petition with the Department of Homeland Security, and the timing is especially important as evidence comes to light showing that the privacy safeguards don’t work while the devices just are not very effective. The organizations contend that the body scanners are not effective and are not designed to detect the type of powdered explosive that was involved in the December 25 incident. They also say that the privacy safeguards do not work and that the body scanners violate sincerely held religious belief. The groups contend that body scanner systems are “uniquely intrusive” and subject all travelers to an unreasonable search in violation of the Fourth Amendment. They also say that the Department of Homeland Security failed to comply with the Privacy Act when it did not inform the public about this new system that would collect personal information. And they say that the Chief Privacy Officer violated the law when she approved the program. The 30 organizations who have signed this petition include the Electronic Privacy Information Center (EPIC), the Bill of Rights Defense Committee (BORDC), the Asian American Legal Defense and Education Fund (AALDEF), the Council on Islamic-American Relations (CAIR), the Center for the Study of Responsive Law (CSRL), the Liberty Coalition, and Public Citizen. Certainly a very worthy effort, as “security theater” encompasses far too many of the privacy degrading policies our government has enacted—a Bush administration course that we continue to encourage President Obama to change. I find it particularly unfortunate that Pitts’ point on how body scanners do not “work for the purposes claimed and actually harm true security by diverting scarce resources and offending allies and populations critical for genuine intelligence” could be very easily applied to oh so many controversial civil liberties infringing policies. Our country deserves actual security, and we just can not afford this sort of harmful stage play. UPDATE: audio is now available here. We are getting to the point in history, with powerful, miniaturized surveillance cameras and other storage devices and databases, where our lives are continuously surveilled in secret and the data is copied, stored, shared and used with few constraints. The resulting power and control raises unprecedented risks of true totalitarianism even beyond anything in Orwell’s 1984. The truth is that privacy and other fundamental human rights transcend ‘conservative’ or ‘progressive’ ideologies and are the mark of open, prosperous, safe, secure, and successful societies. This presentation will be nonpartisan and should appeal to attendees ranging from Tea Party supporters to progressives, as well as readers, librarians, business people and the general public. The notion of appealing to Tea Party supporters may be particularly controversial to progressives and Obama-supporters in general, yet when it comes to civil liberties it is an integral one to be addressed. The Tea Party is not a monolith of an organization, and despite the myriad of reasons to be cautious about engagement, the Libertarian Ron Paulian contingent especially holds promise to be good faith partners in preventing unwarranted government intrusion into the private lives of American citizens. I will be writing more about the Tea Party with a focus on these Ron Paul supporters soon enough (did you know they held the first tea party in 2007 after literally dumping tea into the Boston Harbor?). For now, though, I want to encourage everyone to show support to people like Pitts that bring this Patriotic message to as broad an audience as possible. UPDATE: video of Pitt’s lecture, Privacy and Technology: Protecting Autonomy in a Transparent World, available here. If this ruling stands, al-Haramain will get a ruling that the wiretapping was illegal. The government will be directed to purge any records it collected from its databases (I’ll explain in a later post why I think this will present some problems). And it’ll be asked to pay a fine, plus legal fees. But the fines, at least ($100 per day per day of illegal wiretapping) might end up being a relative pittance–tens of thousand or hundreds of thousand of dollars. Sure, there will be punitive fines and legal fees for four years of litigation. But the government was happy to settle Hatfill and Horn for millions, why not have this be done for the same range of millions? What al-Haramain won’t get–unless it litigates some of the other issues in the case, which likely canbe dismissed with State Secrets–is access to what the government was doing. Or details of how it came to be wiretapped illegally. I’m betting that the government will be willing to accept the ruling that it illegally wiretapped al-Haramain in exchange for the ability to leave details of how and what it did secret, leaving the claim of State Secrets largely intact. Hmmm, doesn’t seem like precisely the sort of accountability-inducing victory that true civil libertarians from across the political spectrum are hoping for. Then again, it certainly does seem like a positive step on the whole, and we have had far too few of those lately! You are currently browsing the Get FISA Right blog archives for April, 2010. Stewart Fenk on What does it mean to “get FISA right”? 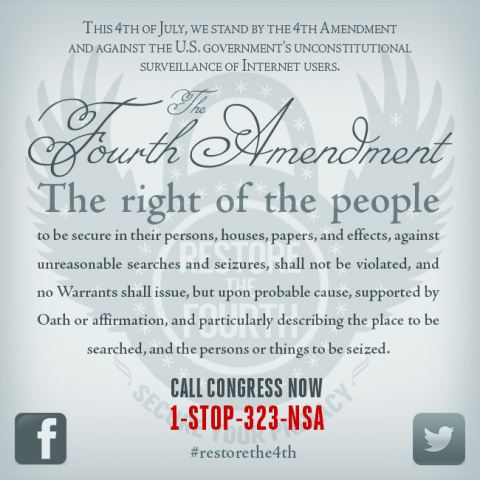 Ten Years Later: Get FISA Right and the Future of Civil Liberties Activism | Get FISA Right on Restore the Fourth: Grassroots civil liberties activism is back and better than ever!